I frequently include the term Operational Awareness in talks. I think it’s important for strategy. So I wrote a piece that tried to convey what I mean by the term. This is a simplified high-level example of business data objects found in certain organisations. In the above diagram I have reused an industry example of nine business data objects to represent operational data. A: Party embodies all of the participants that may have contact with the organisation or that are of interest to the organisation and about which the organisation maintains data. This includes data about the organisation itself; data about external organisations; data about external and internal individuals; and, data about the roles of involved parties. B: Arrangement represents a prospective or existing agreement, between two or more individuals, organizations or organizational units that provides and affirms the rights, rules and obligations associated with a transaction between parties. C: Condition describes the specific requirements that pertain to how the business is conducted and includes information such as prerequisite or qualification criteria and restrictions or limits associated with the requirements. Conditions can apply to various aspects of an enterprise’s operations, such as the operational parameters of a resource item, the sale and servicing of products, the determination of eligibility to purchase a product, the authority to perform business transactions, the assignment of specific general ledger accounts appropriate for different business transactions, the required file retention periods for various types of information kept by an enterprise and the selection criteria for a market segment. D: Product/Service describes the services, merchandise or facilities that can be offered, sold or purchased by the enterprise, its competitors and other Involved Parties during the normal course of its business. This concept also includes goods and services that are of interest to the enterprise such as supplies for manufacture. E: Location covers a place where something can be found, a destination of information or a bounded area, such as a country or state, about which the enterprise wishes to keep information. 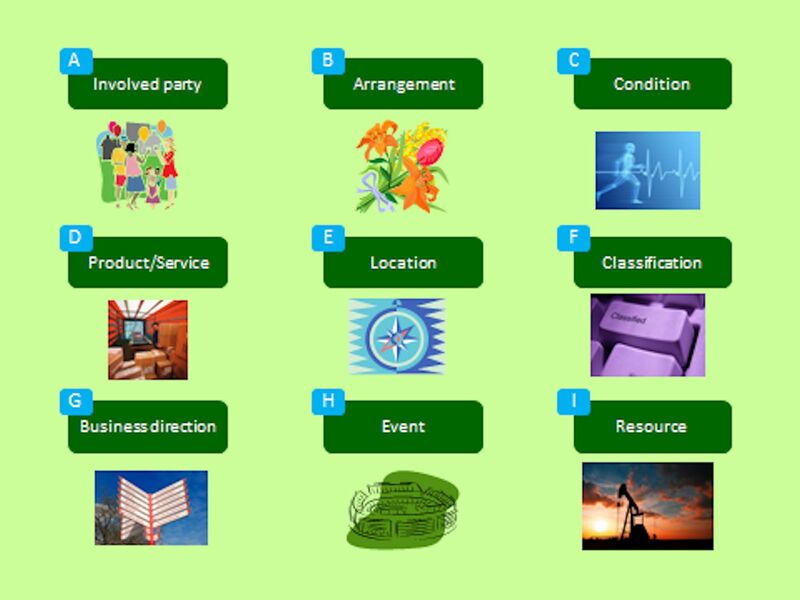 F: Classification is used to organize and manage specific business information by defining structures that represent classification categories. Classification also organizes and manages groups of business concepts that apply to multiple concepts. G: Business Direction/Organisation Direction refers to and records expressions of a party’s intent with regard to the manner and environments in which it wishes to carry out its business. Business direction items contains, keeps data about, and is used to support the enterprise’s business and financial plans, policies, procedures and schedules. H: Events describe a happening about which the organisation wishes to keep information as a part of carrying out its mission and conducting its mission. I: Resource object includes and describes any value item, either tangible or intangible, that is owned, managed or used by, or of specific interest to, the organisation in the course of accomplishing its mission. The key facets of operational awareness detailed above constitute a potential of fundamental importance in the formulation of organizational strategy. Timely, accurate and appropriate data at this level can temper ambition with the facts on the ground, with operation insight, and with the effectiveness of time and place utilisation. But take care. In most organisations there will be a spread of attention to the key facets illustrated here, and they will be treated with varying degrees of intensity relative to their overall contribution to strategy formulation. In addition, organizational specific facets may also be introduced where needed in order to complement the overall set of operational awareness facets described here. On your way to Data Warehouse success? We’ll put a stop to that! One of the most soul destroying moments in the life of a data warehouse professional is when a key decision maker (usually backed by other key decision makers) decides to radically alter course, and “in a dance as old as time”, snatches defeat from the jaws of victory. This can happen in various ways, but the most gut wrenching of all is this. That happens a lot in IT. Young Einstein had a very good excuse, we don’t. It’s 9:45 on a cold and wintry Monday morning; crowds of people are huddled around the water fountains as gossip spreads throughout the building like wildfire. There has been a multiple data pile up in the Widget and Wodget data centre, there are a few casualties but no reported fatalities. No one knows what quite is going on, as shadowy rumour hints at flying pigs, rebellious ducks and rolling heads. It was to be a big day for Widget and Wodget, “your neighbourhood’s favourite Prime Brokers”, it was billed as the Senior Mega Monday to end all Mega Mondays. A mega coup for the hallowed financial institution of W&W; today would be the day that would herald in the culmination of two major IPOs and one multi-billion global M&A deal signed off, as well as the launch of a raft of CDOs. Extracts: And, what would the Ladies and Gentlemen like? It’s a fantastically chic restaurant. It’s one of the best, if not the best in town. It’s Catalan or Basque, for sure. A group of twelve people sit at a round table. Silver service, starched white linen, spotless polished lead crystal glass, the works. There is even a minimalist arrangement of seasonal flowers. The owner of the exquisite restaurant walks across to the table, accompanied by one of her impeccably uniformed staff, who holds a notepad and pen in readiness; “Good afternoon, and, what would our esteemed ladies and gentlemen like today?” she asks. Confused? If you haven’t seen this before then you should be. So just read on fellow traveller.